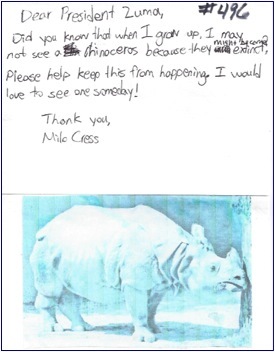 Here is a quick update on our Rhino Letter Writing Campaign. First off we added the talents and passion from another amazing South African organization to our Rhino Campaign. We are proud to announce that the folks from Rhino SA have agreed to work with OMG and SPOTS in an effort to raise awareness to the issue of poaching and to help spread the word to schools and other organizations throughout the country. Please take a moment and visit their website and make sure you order one (or more) of their awesome Rhino pins and show the whole world you care. 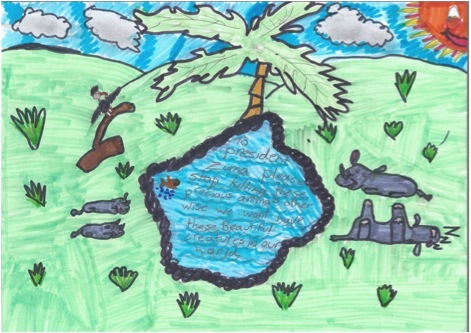 Additionally, Olivia and Carter have been working with the US State Department and in particular with the Wildlife Trafficking Department on ways we can get our Community Rhino Presentation into more schools across the globe so we can help educate students about the issue of poaching and the severity of what is happening to Rhinos. The State Department has been very helpful and put us in-touch with the US Embassy in South Africa. We wish to thank Lydia Campbell who is the local representative for SPOTS here in the US for her help in the filming of the video. We have also asked the State Department to help us make contact with their US Embassy in Vietnam and China since both countries currently have the highest demand for Rhino Horn. Our goal is to get our Community Rhino Presentation into as many local schools in Hanoi and Beijing as possible so we can educate the next generation of leaders about the myths behind Rhino Horn usage. Schools in both countries are now closed for their respective holiday season and we hope to resume our efforts at both Embassy’s in mid Jan.
We were recently contacted by a teacher at De La Salle Holy Cross College based in South Africa and they are also working on collecting letters for our Rhino Campaign. They have already collected over 400 letters from students at their campus which they will be sending in early Jan. The US Embassy also had a representative from the WWF in South Africa at the outreach program who was so impressed with our campaign and the response from the students, that they are looking into ways they can possibly introduce our campaign to their global fan base. We are currently working with Jo Shaw who is the Rhino Co-ordinator from the Biodiversity Unit, at WWF-SA and we are looking forward to seeing how we can partner on this initiative. We have received letters from all over the world supporting our efforts and we continue to reach out to every contact we can to spread the word about our efforts. 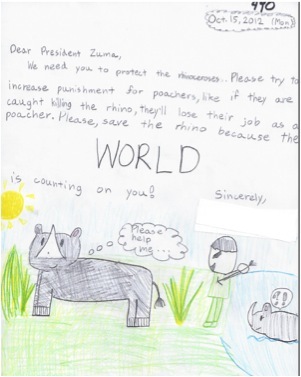 Olivia and Carter are scheduled to be guest speakers at the Northwood Elementary School in Atlanta in mid Jan where they will be presenting their Rhino Presentation to over 750 students, all of whom we hope will also write letters to President Zuma. We have also been contacted by a local Deaf School who is interested in having Olivia and Carter come and present their campaign to their students as well. If you know of any school or community organization that might be willing to present our outreach program, please let us know. We will gladly work with them to ensure they have everything they need to spread the word. We plan on starting the process of requesting a meeting with President Zuma in early Jan with the hopes we can meet with South African officials in March or April. We wish to thank everyone who has participated in this important initiative for their time, dedication and for caring. If you have not already done so, we recommend that you also visit the website from our partners at SPOTS (Strategic Protection Of Threatened Species) and also check out the folks at The Chirping Birds Society. Anyone who speaks out against something they see is wrong, is essentially a Chirping Bird. Olivia and Carter are Chirping Birds and we hope you too will join this impressive group.